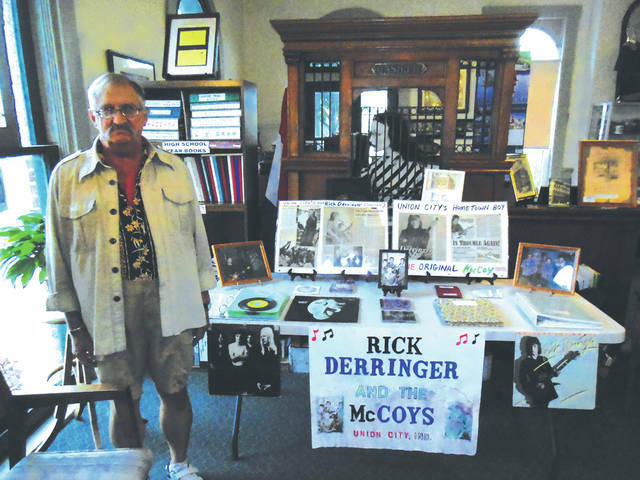 Michael Zehringer, cousin of McCoys lead singer Rick Zehringer, has assembled a memorabilia exhibit which he proudly displays in a museum on Columbia Street in Union City. Festivities at the art show included the unveiling of a mural honoring the band The McCoys, which started in Union City in 1962. UNION CITY — The village of Union City honored a piece of its history at its fifth annual arts festival last week. 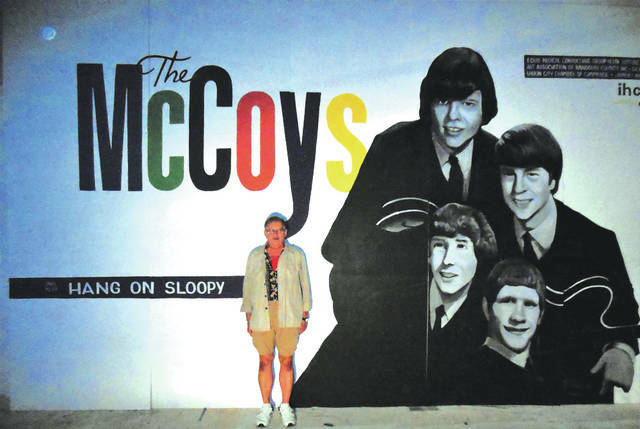 Festivities included the unveiling of a mural honoring the band The McCoys, which started in Union City in 1962. The mural was painted by Indianapolis-based artist Pamela Bliss. Activities at the festival were centered at the Union City Arts Depot with several bands playing at Artisan Crossing Park, including Columbus-based group Nightfall and Password Reset. Many other artists were featured during the festival, including a children’s art workshop. The McCoys started in Union City in 1962. Initially composed of lead guitar player Rick Zehringer, his brother Randy and bass player Dennis Kelly, the group later included Ron Brandon, of Greenville, as keyboard player. The band originally was known as The Rick-Z Trio and played at Saturday night dances at the old armory in Greenville. Later the band added an organ player and became known as The Rick-Z Combo. Later still, the group played in Dayton and surrounding areas as Rick and the Raiders. Greenville-based attorney Ted Finnarn, meanwhile, played rhythm guitar in a rock band in high school, in groups with names ranging from The Deep Six (one member of whom, Bob May, went on to a noteworthy career in Nashville, Tennessee) to Five In A Row. At one time Finnarn’s band opened for The Rick-Z Combo at the armory. Zehringer’s band later changed its name to The McCoys, and it was under this name that the group released its nationwide hit “Hang On Sloopy.” “Hang On Sloopy,” according to Finnarn, went on to become the official rock song of the state of Ohio, as well as a No. 1 hit on the Billboard Hot 100 Chart in October 1965, and is the unofficial fight song of the Ohio State Buckeyes. It is still played many times a year by The Ohio State University Marching Band. “The best damn band in the land!” Finnarn said. Cousin Michael Zehringer, who lives in Union City, has assembled a McCoys memorabilia exhibit which he proudly displays in the museum in the old railroad building on Columbia Street, meanwhile. The museum is adjacent to the Arts Depot and the park. This entry was tagged Band, Mural, The McCoys, Union City. Bookmark the permalink.